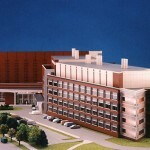 This architectural model project was for the University of Rochester Research Center. The architect: Perkins & Will. The scale: 1/16″ = 1 foot.